Is this possible: USB Modem> SPBM Bridge> Ethernet or Wireless NIC> Switch or Access point ? All I need to do is equal shares to my USB Modem Internet with my family through my laptop acting as SPBM Bridge. It depends. If the USB modem is seen as an Ethernet device, then you can bridge it with another Ethernet card. Otherwise, bridging wouldn't work and you can use the Internet Connection Sharing (ICS) instead. The ICS is a built-in Windows service described here. And about ICS let me say that I have another pc with two NIC instead of my laptop and connect the USB modem, do you mean that I can share the internet with one of Ethernet acting as external network and after that make a bridge with the other Ethernet acting as internal network? In this case, the switch/AP would be connected to an Ethernet NIC. 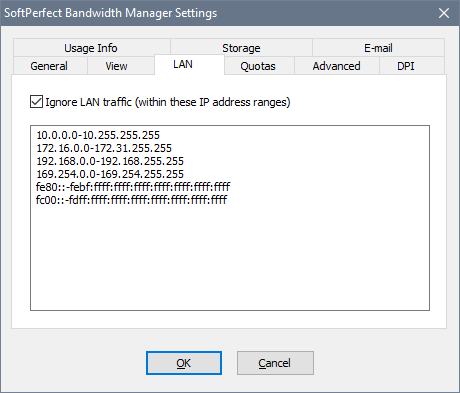 The Internet is available to anything connected to the switch/AP, while Bandwidth Manager filters all communications between those devices and the modem. Could you please give me an example of the rule that sharing the internet to IP range upload and download ? I can give a rule example, but it's important to understand that rules don't do any routing or NAT. In other words, the software is merely a traffic filter and rules should only be created after the Internet is working, for example through the ICS. Though I'd like to stress it again: rules should be created after the Internet access is already available to the LAN devices. Now every device connected to the AP has internet access, but the problem is when I installed SPBM and make the rule above can't control the traffic. Is there any rule or specific configuration to make this work? Test if the rule has any traffic flowing through it. If it does, you can then proceed with defining bandwidth restrictions for your clients. If it doesn't, probably Connectify captures traffic before it reaches BM, in which case I am afraid there may be no solution.